Boston and the surrounding areas in New England are known for extremely cold winters with temperatures that fall below zero, but it is the strong winds that often wreak the most havoc on our area. We are regularly dealing with blocked streets and power outages due to downed trees. This causes road hazards, but it can also knock out heat, which can be a deadly problem. While most of us of would rather stay inside during the worst of the winter weather, the many tree workers in Boston must brave the worst conditions. It’s a very dangerous job that can result in serious personal injury of even death. For these workers and their families, a Boston workers’ compensation case is often the only remedy available for financial recovery. The amount of compensation for these types of specific injury will depend on the area of the body injured and the extent of the damage. For example, if a worker in Boston suffered an amputation, the specific injury compensation would be greater for the major (dominant) arm than it would be for the minor (non-dominant) arm. A loss of an entire major arm would entitle the worker to more damages than a partial amputation such as the loss of a hand. It does not have be an actual amputation, but rather only the loss of function from something such as nerve damage. 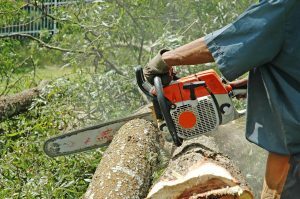 If a worker was operating a chainsaw while trimming trees in a bucket truck during a storm call and lost his entire major arm, compensation would be calculated as the sum of the average weakly wage in Massachusetts (AWW) multiplied by 43. If there was a total amputation of the minor arm, it would be the average weekly wage at the time of injury multiplied by 39. In the event that both arms were lost in the Boston workplace accident, specific injury compensation would be the average weekly wage at the time of the on the job accident multiplied by 96. This means that if the average weekly wage at the time of the injury was $1,000, and the worker lost both arms, the specific injury compensation would be $96,000. Again, this specific injury compensation would be payable in addition to any money awarded as part of the standard workers’ compensation benefits that would include lost wages and past and future medical bills. According to a recent news article from The Falmouth Patch, a tree worker suffered a serious workplace injury when he was working with a chainsaw. Authorities say the worker, who was 46-years-old, was trimming trees with the chainsaw at a local condominium complex when he suffered what are being described as life-threatening injuries. An investigation is still being conducted but witnesses say the chainsaw appeared to have caught his clothing and then bucked out of control causing him to receive severe lacerations on one of his legs. The chainsaw caused deep lacerations and damage to the major artery in his leg which resulted in a significant loss of blood. When first responders arrived on the scene, they applied a tourniquet to stop the bleeding. He was taken by ambulance to a local trauma center and a medevac helicopter was called in to to meet them at the hospital. He was then medflighted to a regional level one trauma center where he was rushed into an operating room with a vascular surgeon. The extent of his injuries have not been reported and the U.S. Occupational Safety and Heath Administration (OSHA) has been called in to conduct a further investigation. There has not been any allegations as to fault or negligence as of the time of this article. One main aspect of the workers’ compensation in Massachusetts is that it is a no-fault system so there is no requirement that any fault on behalf of the the employer be demonstrated. It also would not help if fault was established in the vast majority of cases unless we are dealing with the negligence of a third party. These situation with third party fault often involve car accidents in which the worker was injured while driving on the job by an at-fault driver was not a coworker or the employee or one of the employer’s agents such as manager or supervisor. All that is necessary to establish is that the worker is an employee and was injured while on the job. This does not need to be the actual job site so long as the employee was acting in furtherance of his or her employer’s interests.